"Discover Cutting-Edge "Brain Training" and Play Peak Performance Golf… Entering "The Zone" On Command, Slashing Your Handicap, and Shocking Your Golf Buddies - Without Additional Practice"
EVERY golfer knows that what seperates the good from the elite is the mental side of the game. Sure, there are the issues of natural talent, starting golf instruction at a young age with good coaches, disciplined practice, strength and conditioning, and pure determination. These are without a doubt vitally important factors. But they are rather meaningless if you can't hang with the big boys on the mental level. The elite golfer performs consistently well physically because he doesn't screw up mentally. Stephen Ladd and Bill Gladwell here; we're known as the Renegade Mental Coaches because we don’t buy into the mainstream sports psychology BULLS***!! Together we have over 37 years of intense personal and professional study into the mind-body connection including four academic degrees, dozens of internships with the most respected authorities in the sports and personal change arenas, and extensive travel throughout southeast Asia in search of more substantial (and certainly lesser known) answers to the question of which techniques do champion athletes use to gain the mental edge over their opponents. In the end, we were able to formulate a simple do-it-yourself system that generates all of the benefits of traditional sports psychology, hypnosis, energy medicine and meditation practice - without all the psycho-babble, drum circles or the need to sit and stare at a blank wall for hours. 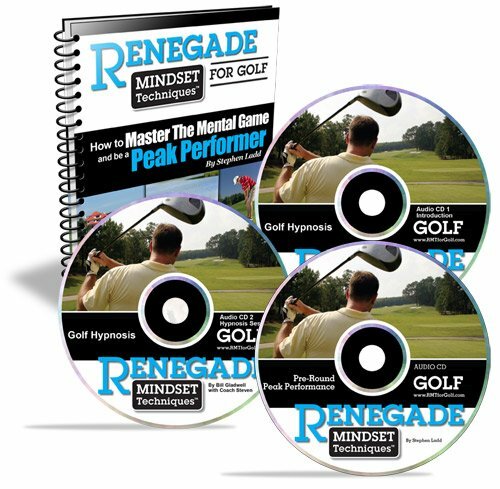 Renegade Mental Golf is a Coaching System that will attack your mental roadblocks and get you into peak performance form. We won’t waste your time with any fluff. From the 1st page through the last MP3 Hypnosis session, we’ll share our best insider-secrets to mastering the mental game of golf. There are a few different ways to be hypnotized. There’s stage hypnosis where people are convinced they are chickens and do ridiculous stuff on stage. There’s therapeutic hypnosis where you are placed in a deep trance where you lose track of time and wake up later unaware of what you said or did…. And last is waking-hypnosis. We use this in the Renegade Golf System. You simply listen to Bill put you into a light trance. We use the light trance to convince your subconscious to start working on improving your golf game. At the end of each session you’ll feel relaxed, focused and ready to play a serious game of golf! The great part is that you can use the hypnosis whenever you need to sharpen your focus, relax or heighten your awareness. We’ve adapted the powerful science of Neuro-Linguistic Programming to Golf. This is the same system that Anthony Robbins uses to turn NBA Players into foul-shot whiz kids and gives elite Olympic athletes the Gold medal edge. We’ll show you how to use simple NLP techniques to sharpen your focus, isolate your mental roadblock, and experience game-changing breakthroughs. I’ll show you how to induce a state of profound relaxation and mental focus with just your fingertips. It’s like acupuncture but doesn’t require the needles. Skeptical... I don't blame you. But I’ll show you! The system includes a comprehensive manual that explains the technique in detail – with photos. PLUS, we’ve included an Audio MP3s to talk you through the process (More on that in a moment). Golf Game to a Whole New Level! We’ve put almost 50% of the Renegade Golf System on Audio MP3 Downloads to make it easy for you listen to on your schedule. Plus, we believe you can soak up the information easier listening to us take you through each of the concepts. When you get the System, you’ll be able to download Five MP3s, plus the comprehensive manual explaining the entire system. 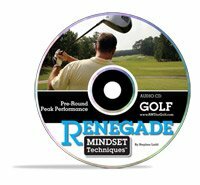 This pre-round CD takes you step-by-step through 2 Renegade Golf Energy Psychology routines to eliminate all tension and anxiety and then to instill unstoppable confidence in any area of your game that has been lacking. It’s like having your own Renegade Coach with you before every round. • Steal Tiger Woods' instant "Drive Trance" technique... and enter into the ideal Mind/Body State for optimal Power and Distance. • Program your subconscious mind with all of the crucial swing thoughts (regardless of your swing style)... never get bogged down with the epidemic of "paralysis by analysis" again. • Attain the perfect combination on structural stability and muscular fluidity... the two essentials of consistently driving the ball long and straight. • Step up to every tee box with supreme confidence, knowing that the outcome is pre-determined... all you have to do in hit "GO". • Finally become one with your swing (it's not as far out as you might think... and it's the ONLY way to go low day in and day out). Learn how golf is like walking a tightrope (the mental process necessary for success is exactly the same). • Transfer your perfect practice swing over to a dead-on reliable swing on the course... where it really counts. • Let go of muscle tension... instantly... for a silky smooth swing - every time. • Own the smooth and easy flat stick stroke of a seasoned pro... without the backbreaking hours on the practice green. • Eliminate three putts. Discover how ancient Zen archers tricked their minds into believing it was impossible to miss... and how you can steal their methods to drain putt after putt on command! • Effortlessly link up your unconscious mind and your body every time you approach a green (the KEY to consistent scoring). Turn on confidence faster than flicking on a light switch. • Once you get your unconscious mind and your “awake” brain on the same team, you’ll be a very dangerous golfer. That’s not all: We’ve put the entire Renegade Golf System in a simple-to-read instruction manual. We illustrate the key concepts and provide photos to demonstrate each of the techniques. You can print out the manual and make notes or read it on-screen. You can even stuff the manual in your golf bag so you have everything at your fingertips. • Why most golfers NEVER reach their true potential! (Here's a hint: hard work has nothing to do with this!) And you’ll also discover the little-known reason why practice does NOT make perfect. 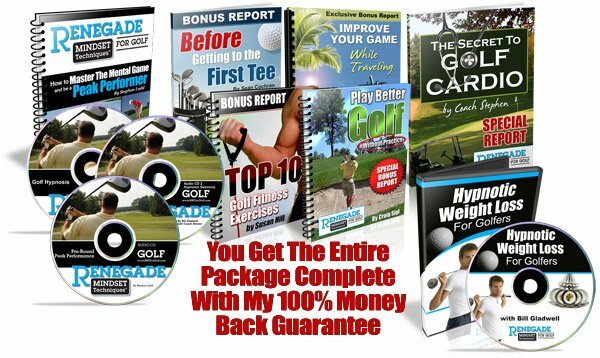 • How to focus and kick any part of your game up-a-notch!...From the tee to the pin, get little-known performance tips that will leave your competition in the dust (we won’t waste any time – many of these performance enhancers work in under 45 seconds). • Discover the amazingly simple mental strategies developed by a Stanford Engineer to help war veterans overcome post-traumatic stress disorder (PTSD)... and how to use these same tools to shave strokes off your game... Instantly! • How to enter "the zone" at will... and stay there. Plus we’ll show you why traditional positive thinking actually hurts your game... and what to do instead! 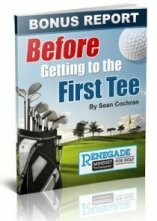 • How to eliminate tension on the tee box... especially the dreaded first tee, automatically - CRUSH that first drive long and straight... and set the tone for the entire round. • Drain putts with obnoxious confidence - your friends may start to actually hate you (but I'll bet you get over it). • My popular “chock antidote” to erase your fear and doubt, no matter how tight the fairway or ominous the water hazard. • The "secret", fool-proof technique that has been missing from your pre-shot routine (this is the quickest way to slash strokes from your game). 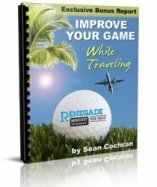 • What to do AFTER every shot that is absolutely vital to playing your best (this is something 99% of all golfers know nothing about... and it shows on their scorecard!). • Get rid of negative barriers that are ruining your focus and costing you strokes... (you're probably not even aware of them) while developing the laser focus most golfer work their entire life to achieve! • How your fingertips can help your game (trust me - you've never heard this before!). • Shatter your limiting beliefs about your game… NEVER feel embarrassed or self-conscious about poor play in the past... and play with power! Can improving your mental focus and clarity really add teeth to your golf game? "As a PGA Professional, I play a lot of tournament golf, and find myself in a lot of pressure situations. Coach Stephen has given me the simple tools and techniques to get myself into a calm and focused state before my events. Being able to step up to the first tee with this mindset is incredible." "In addition to your excellent book curing me after 6 years of the yips, I got my first hole in one after 20 years during a recent outing on Spain. A coincidence…I don’t think so! Thanks to you I’m swinging better, feeling better, and playing better than ever. This stuff is really GREAT! "Bill Gladwell’s golf hypnosis course is fantastic. I couldn't believe the results after the first twenty minutes of listening to the CDs. Wow! I finally feel like my stupid brain isn't getting in the way when I'm lining up to swing. I'll tell you what, you remain a skeptic, I'll continue to use Renegade Golf hypnosis and I'll meet you at the course. Just don't forget to bring your wallet." As a competitive golfer, I look for every possible advantage. I read all the mainstream books on the mental side of golf, and even saw a respected sports psychologist for private sessions, all to no avail. Then I was introduced to Renegade Mindset Techniques for Golf. RMT is a totally different animal! To say that it has completely changed my game would be an understatement. I don’t ride the roller coaster of emotions anymore. The best way I can describe it is a “relaxed focus”. RMT is so simple yet so powerful!" "I have NEVER felt more relaxed and in control on the course! I have consistently driven the ball well and have really improved my greens-hit-in-regulation and short putting (from 6ft and in). I look forward to continuing your re-enforcement techniques and I am confident that I will continue to improve my scoring. THANK YOU !!!!!!!!!!!!!!!" 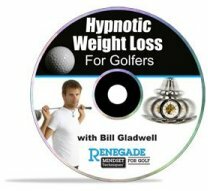 "I saw IMMEDIATE results in my golf game after being hypnotized. And my golf game continues to get better by several strokes when I listen to the CDs the night before a round. I’m extremely happy and I credit Bill’s hypnosis for lowering my handicap by 4 strokes in a short period of time." "Thank you for your amazing techniques. They certainly are unusual, but so are the results. My instructor is thrilled with my new ability to quickly make the swing changes he wants me to use. I feel so confident on the course. I never knew it could be this fun!" "I’m a decent golfer (6 handicap) but have always been embarrassed by my lack of distance off the tee. I’ve tried several instructors, new clubs, and even started going to the gym. After all of that time and money, I saw almost no improvement. My wife bought your book for me as a birthday gift. I was a little skeptical at first, but not for long! On my first golf outing I was out-driving my partners who usually have me by twenty or more yards off the tee. I was able to relax and my swing felt so fluid. I can’t really explain it, except to say that it felt easy. That’s a first for me." "I used the CD with my IPOD before my round and shot a 42 for nine holes with only 15 putts. It was even the first round with my new clubs. This stuff is cool!" "I hate to break it to you, but I’m never telling the members of my club about RMT. I’ve dropped my handicap by four strokes in the last two months while spending less than half the time practicing as normal. I’ve won two local tournaments, some money and tons of respect. I want to thank you, but I’m going to keep this secret to myself. Don’t count on any local referrals from me." "Coach Stephen, the method of golf you have introduced is extremely revolutionary. My journey in golf is very serious even with a hectic schedule. You reshaped how I thought the game had to be played and it has done wonders for my scores and confidence. I definitely recommend your program! Thanks again!" I've gotta tell you about an experience I had this past Sunday on the course. I listen to the hypnosis sessions every night before bed. Yesterday I shot even par for the first time ever. I was so relaxed, it almost felt like I was on auto pilot. I really have to give your hypnosis sessions credit for helping me attain this. I am a big believer in your techniques and methods. Thank you!" "I just tried one of your simple tricks yesterday and I couldn't believe the results. This seems so weird that it is embarrassing to share with friends before you start hitting the ball and after you hit some balls, you don't want them to know what you ``changed`` in you swing. I sure hope I am the only one that knows that trick at my golf course. I was laughing all the way and I played my best game ever. It made me feel so confident on the golf course. Thanks for sharing and I look forward to more of your mind-bending updates." These golfers come from all over the world and represent all ages, guys and gals. Do you think they’re any different than you? No way. They all wrestled with their golf game and EVERY SINGLE ONE of them used the Renegade Mental Golf System to get fantastic results. Some were shooting the games of their lives 20 minutes after using the system! These folks are my heroes because they put their ego aside and took action to improve their game. Some were cynical but they put aside their doubts to give the system a chance – now they are free of anxiety, rocketing tee shots straight downrange and draining putts like the pros on tour. What My Personal Coaching Clients Pay! So, when they hear that I’m offering you the Renegade Mental Golf System at a fraction of what they paid (just last weekend) they will not be happy. Here’s the deal: My complete course would normally be priced at least $500. However, I’ve been able to convert the whole system into downloadable format – so you don’t have to pay for a glossy printed version. Also, you can download the entire system directly to your computer which allows me to pass on the shipping savings to you too. Also, this is a one-time cost – no hidden membership fees or other shenanigans. You should race to the order button now – because this is the best deal you’re going to get on a golfing tool this powerful. It’s simple: Order and download the complete Renegade Mental Golf System. Listen to the Audio CDs and devour the instructional manual. When you’re ready – play a round of golf, hit a bucket of balls or line up a few problem putts on the practice green. Pay close attention to how you feel. If you aren't noticeably more confident, focused, and dialed in on your game then you are entitled to a 100% money back refund! Just send me an email and I will promptly refund your money. No forms, support phone lines or other hoops to jump through. You can even keep the course AND the bonuses. Why am I being so generous? I am doing this because every single golfer that has put the System to work on their golf game has been thrilled with the results. They’ve written me love notes and sent in videos and left me voice-mails explaining how the system has taken their game to a new level. I'm sure that the System will work for you too... I'm staking my reputation on it. I’ve decided to stuff this offer with a hand-picked goodie pile of coaching must-haves. I’ll give you access to them for free the moment you order the Renegade Mental Golf System. Elite PGA Pros know that the game actually starts before you get to the first tee. The 9th hole is NOT the time to run out of gas. Sean Cochran will show you the techniques that the pros use to start AND finish 18 holes strong. Golf, like any sport, requires some constant practice to keep your edge. But what do you do if your travel schedule keeps you off the range? No problem! I got Sean to write a quick guide with easy drills to keep you sharp on the road. Superior conditioning is one reason why my students consistently crush it on the course. My students can blast cruise missiles off the tee all day long AND have the fine motor control to drill perfect iron shots. My secret weapon is an arsenal of specialized Fitness exercises pioneered by Susan Hill. 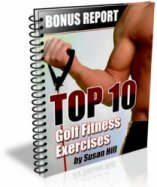 You’ll get to see for yourself why Susan is one of the most sought-after golf fitness coaches in the country. 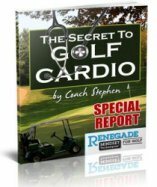 Special Report – “How Traditional Cardio Exercises is Making You ‘Golf Stupid’ and Crippling Your Shots Off the Tee – and What to Do Instead. If you are peddling away for 30 minutes on a stationary bike or jogging 12 miles per week in hopes of improving your golf game - you are wasting your time! Find out the secret to golf cardio that actually increases your power (both physical and mental) AND is incredibly time efficient (less than 13 minutes per session). Whoa – this report is pure dynamite. But I respect Craig Sigl and his no-practice techniques are pure gold. If you don’t have time to slave over buckets of balls at the range then you’ll love this controversial little manifesto! That’s right – we’re putting an additional hypnosis CD in the package from our popular Weigh Loss Program. Why don’t you kill 2 birds with one stone? While you are training your subconscious for elite level performance – go ahead and use the SAME TECHNIQUES to effortlessly drop a few pounds too! Additional Bonus - FREE Upgrades for LIFE! We are constantly exploring new methods and technologies in alternative sports psychology. You will get immediate access to all new materials, whether that be a new or re-worked chapter in the manual, or additional hypnosis tracks that are added to the program. You get any and all upgrades to this program FOR LIFE. You may need a little more help than the next guy. I understand that a manual and 4 CDs and a bucket-full of special reports may not take you all the way to your peak of golfing greatness. You’ll probably need to ask me a few questions. I get it. That’s why I’m offering 30 Day Email Coaching spots for 50 quick-acting students. If you have any questions about your game…how to get more distance off the tee, putting green confidence or some insider tips on winning the Club scramble (or win more bets) then send us an email. We’ll do our best to get you a detailed answer back within 48 hours. We take these questions very seriously, so we spend more time than we should on crafting detailed answers. This means that we can only take 50 students. The 51st student is put on a waiting list – NO EXCEPTIONS. The BEST WAY to lock-in your spot is to move quickly and order the Renegade Mental Golf System pronto! Go ahead and click the order button and tell me to rush you the download information for the Renegade Mental Golf System. You’ll be able to get started right away. But, I do have one favor to ask. Don’t be a stranger. Once you see the System work for you, please take a moment to send us an email telling us about the success you’re having. P.S. Go ahead and order right now while this is fresh on your mind. There’s no risk and with our guarantee, you can test drive the system for 60 full days. I am not sure how long you’ll be able to purchase the course for just $57 – so don’t let this chance to supercharge your game pass you buy. Click the order button below now! P.P.P.S. - I've gone to every length to be as descriptive as possible of what you'll find in The Renegade Golf Psychology System, but in the event you have any more questions, I've included an FAQ that I think will help you out. Our merchant account uses SSL (secure socket layer) technology to protect your information from being viewed by any third parties. Even as the website owner myself, I don't have access to any credit card information that you input for the order. Only the bank processes the information. You'll notice that when you get to the page where you are inputting your card numbers, the beginning of the web URL will change from http to https. That indicates that you are on a secure page and the info cannot be found by a 3rd party. Keep that in mind on any websites where you are using your credit card. Always look for the https at the beginning of the web address on the actual page where the card info is requested. Q: What if The Renegade Golf Psychology System doesn't work for me? Then it's free. Our system has been tested in the real world with golfers at all levels of experience and training, with overwhelming success. We are confident that it will work for you as well. If, on the off chance, you're not thrilled with your results after using the system for 60 days, we'll promptly refund 100% of your investment. You can even keep the entire system and all the bonus materials. Q: Will this system work for a beginner as well as an advanced golfer? Yes! Although some of the specific mental game challenges are different for beginners and elite golfers, our techniques are easily adapted to your individual needs. The two basic goals of our system are the same regardless of your experience level: 1) Empower you to control your mental/emotional states and 2) Program your subconscious mind for golf success. These “super-human” skills and thought patterns will serve you well if your goal is to break 100 or win your Tour Card. Q: How long does it take for The Renegade Golf Psychology System to arrive? No more than about 1-3 minutes (the only variable is your Internet provider). As soon as you complete your purchase, you'll be given instant access to E-Manual and Audio Hypnosis Sessions in the system. No need to wait and wait until it arrives in the mail, or pay additional fees for shipping. Q: Does it matter what country I'm in and is the sale in US dollars? You can order online no matter what country you're located in. We've processed orders from over 63 countries so far. Our secure credit card processor will automatically convert the US dollars to your country's currency. 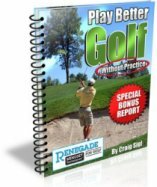 NOTE: The Renegade Golf Psychology System is a completely downloadable product of an E-manual and audio files. No physical products will be shipped. After you order, you will get INSTANT ACCESS to download all product components onto your computer (no waiting or shipping costs!). The format for all E-Manual is adobe acrobat PDF, which can be viewed on Mac or PC. The hypnosis audio are MP3s, also compatible with both Mac and PC. Please read our Renegade disclaimer: Due to recent statements from the FTC, it is required that we identify what a typical result is. The truth: most people never do anything with the products they buy, so most of the time, their typical results are zero. However, assuming that you actually apply the techniques and strategies in our system, we except your results to be anything but typical. Bottom line: results vary from person to person based on a variety of factors. You are not guaranteed to obtain the same results as the golfers in the above testimonials, just because you purchase our system... YOU are the most important variable. The success statements and examples on this website are not intended to represent or guarantee that everyone will achieve the same results. Each individual's success will be determined by his or her desire, dedication, effort and motivation to work and follow recommendations. There is no guarantee you will duplicate the results stated here. Average improvement is dropping three strokes per round in a three week period of training, begining with a 15 handicap.